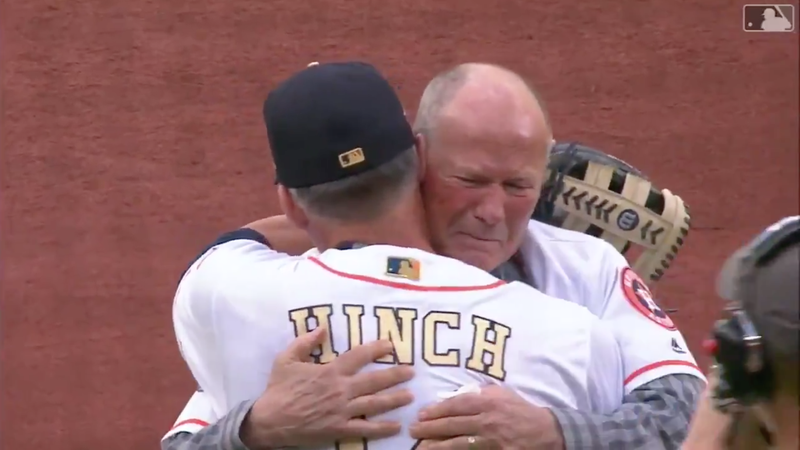 Not everything about the Houston Astros’ pregame celebration today went exactly as planned—they probably would have preferred a little less wind for the unveiling of their World Series banner—but the first pitch was legitimately touching. Former first base coach Rich Dauer did the honors, five months after he was rushed from the team’s championship parade into life-saving brain surgery. When Dauer initially felt unwell during the parade, team trainers thought that he was likely simply dehydrated. While he was being transported to the hospital, things began to look more serious, and the coach was ultimately diagnosed with an acute subdural hematoma. Doctors estimated that Dauer, who is now retired, had just a 3 percent chance of surviving the surgery. But he pulled through and has since recovered nicely, as Ken Rosenthal detailed at The Athletic a few months back.